From 1942 onwards, Aemilius Müller (also see his first colour-system) wished to advance an area first opened up at the time of the First World War by a pioneer of modern colour theory: namely, Wilhelm Ostwald, the Nobel prize winner for chemistry. Ostwald had based his concept for colour on the double-cone, which Müller then took over and improved. The colour-hues in the colour-circle — which uses the frequently mentioned and thus already familiar double set of three basic-colours — are spaced at intervals perceived as equidistant. Their numbering is arranged clockwise from 1 to 60 — graphically clear, since we are already accustomed to the 60 divisions of a clock’s face. The illustration shows one of 60 possible triangles of equal colour-hue (which can be extracted from the Müller double-cone as a vertical radial section) with white, black and the respective full-colour located at its corners. In each case, Müller allows for ten gradations between each point of the triangle in order to better explain the proportions of the three variables, and identifies the corresponding positions along its edges by means of digits. 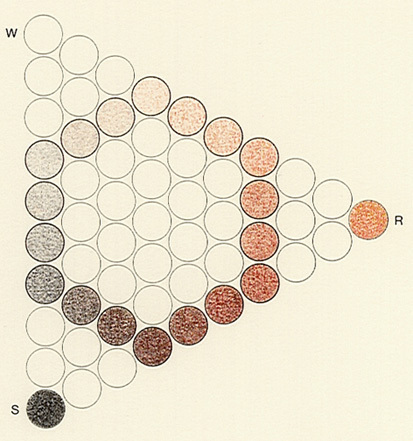 The colour atlas which arises from the double-cone system — the famous Swiss Colour Atlas, the first edition of which was published in 1962 — reproduces a total of 2541 colour fields. As the great Ostwald before him, Müller strove towards «the aesthetics of colour in natural harmonies». 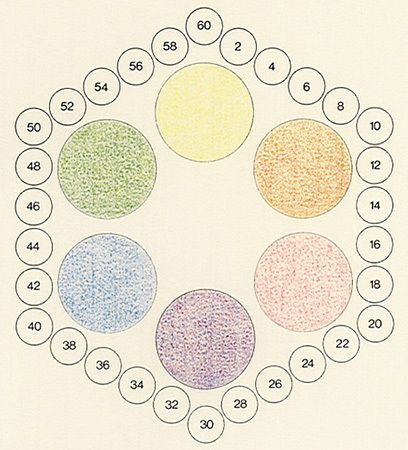 A work of the same title was published in 1973 and contained a collection of 200 colour-tables supposedly showing the fundamental relationships of colours. 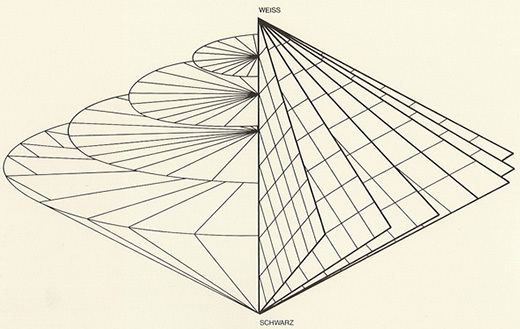 Werner Spillmann, a lecturer in colour design at Winterthur, Müller’s home town in Switzerland, labelled this important work a «collection of highly refined colour studies», and summarised it as follows: «The basic theme of this collection of colour-charts concerns the possibilities for linking the contrasting elements of a compilation of colours. The tables provide rich and impressive solutions for this problematic area-solutions which, in the visual sense, can always be directly experienced and understood. The creator of this singular work makes no secret of the laws on which he has based it; on the contrary, he has attempted to reveal their simplicity, out of which many pleasant-sounding colour combinations can arise.» Whoever should wish to deepen his appreciation of art through a more thorough grasp of colour will be well placed with Müller. 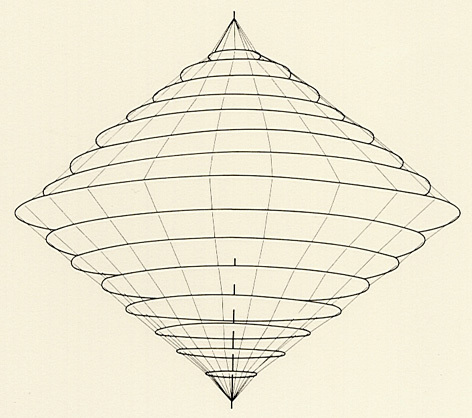 Date: Aemilius Müller presented this double-cone diagram in 1965. Bibliography: Ae. Müller, «Swiss Color Atlas SCA 2.541», Winterthur 1962; Ae. Müller, «Ästhetik der Farbe, in natürlichen Harmonien», Winterthur 1973; W. Spillmann, «Ein Leben für die Farbe», Applica 24, p. 717 (1984).